Nana’s newest dynamic venue, Spectrum Lounge & Bar welcomes all for a vibrant night of revelry. 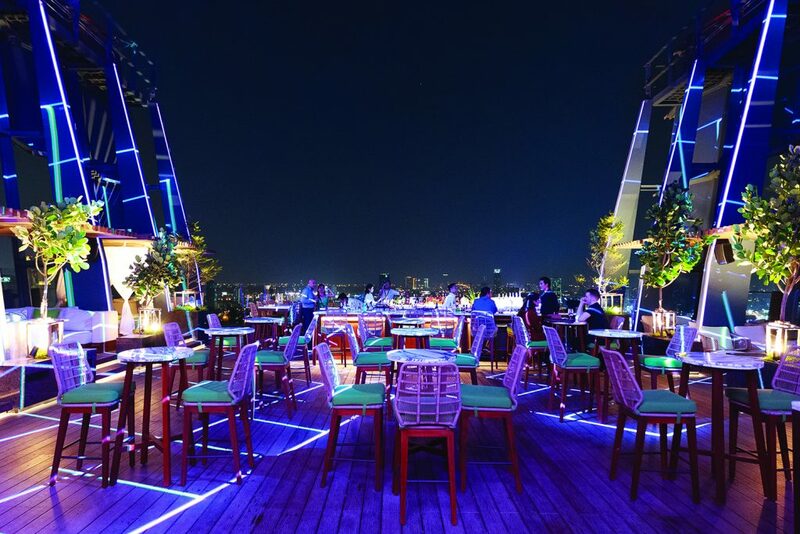 Bathed in the warm glow of golden spotlights, Spectrum Lounge & Bar is a multi- purpose space that covers the top two floors of Hyatt Regency Bangkok Sukhumvit, tripling as a lounge for a casual dinner, a bar for after-work pick-me-ups, and a top-shelf nightlife venue with a club-inspired vibe. 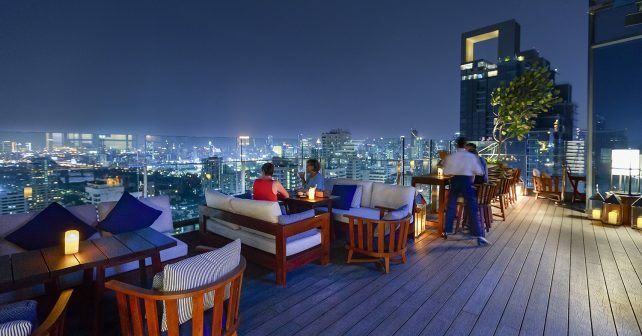 It can definitely stand on its own among Bangkok’s current crop of rooftop bars. the cosy lounge atmosphere inside. Known as the ‘living room,’ the area is cleverly adorned with cushioned chairs, wooden tables and velvet blue carpets. The chic vibe is also enhanced by jazzy tunes from the talented pianist. Wander outside and you’re treated to spectacular views along the balcony. However it’s the upstairs area that is the real pièce de résistance. Alluding to an outdoor nightclub, the wooden deck is framed by steel and glass panels with a large LED screen in the centre to display visuals that accompany each thumping beat from the suspended DJ booth. From 6pm to 9pm, guests can recline on one of the snug daybeds with immaculate views, while enjoying lounge tunes. However, after 9pm is when the DJ leads the crowd onto the dance floor for a mesmerising kaleidoscope of colour and sound. Although primarily a bar, the establishment also offers an inclusive menu of tapas-style dishes. We were first served the robustly flavoured Pork larb balls (B250), crispy spheres of minced pork infused with spicy and tangy Thai seasonings. This is great to pair with any local or imported craft beer. 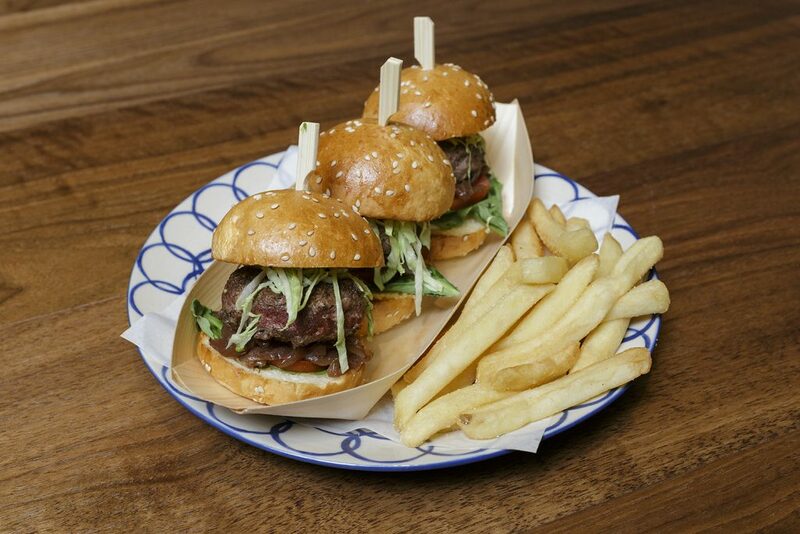 a real treat with toasted buttery buns complemented by generous meat patties. Seafood aficionados will relish the rock lobster tail soaked in garlic oil and lightly seared for a subtle smoky taste. The larger plates include one of their winning attractions, the BBQ Wagyu beef finger ribs [with] mushroom spinach salad (B850). This succulent meat is renowned for its marbled texture, while the accompanying salad dressed with lemon gives a pleasing contrast. 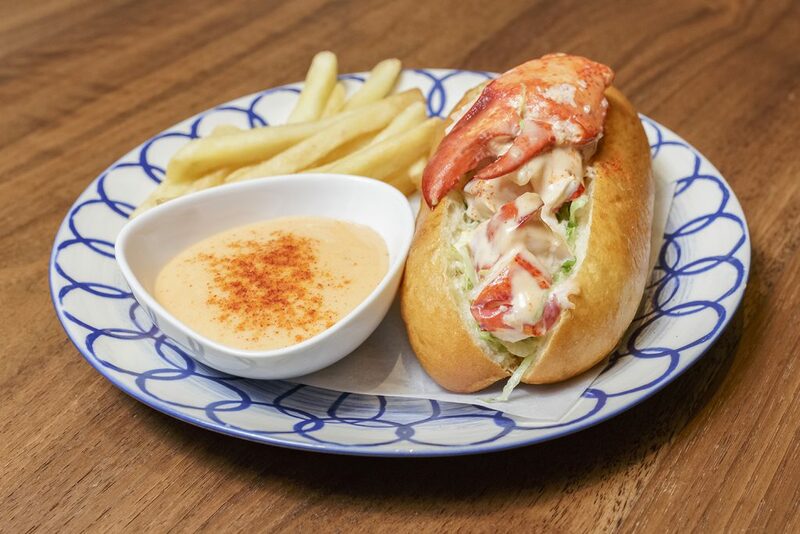 Their next prime catch is the Lobster roll, French fries (B790), which consists of perfectly seasoned chunks of crustacean delicately doused in creamy mayo. Vegetarians will especially enjoy Burrata with seasonal truffle (B950). What’s special is that the burrata is freshly made in-house, so the smooth consistency is not compromised. the Irish whiskey blends seamlessly into the sweet mix, ensuring you leave Spectrum Lounge & Bar on a sugary high. As expected, Spectrum Lounge & Bar stocks a wide range of spirits and liquors, proudly displayed on the sizable bar counter. 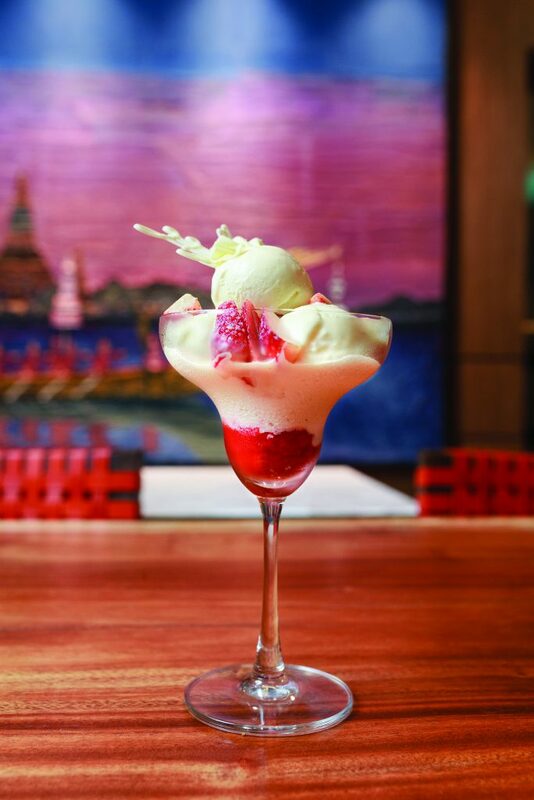 Here, the bartenders let their creativity shine with drinks that incorporate Thai ingredients. Among the signature highlights are Eddy Murphy (B290), a creamy luscious mix of Malibu, Midori, pineapple juice, lime juice and egg white. Reminiscent of a piña colada, this sweet version evokes visions of palm trees and lazy days spent by the beach, making it the perfect after- work beverage. 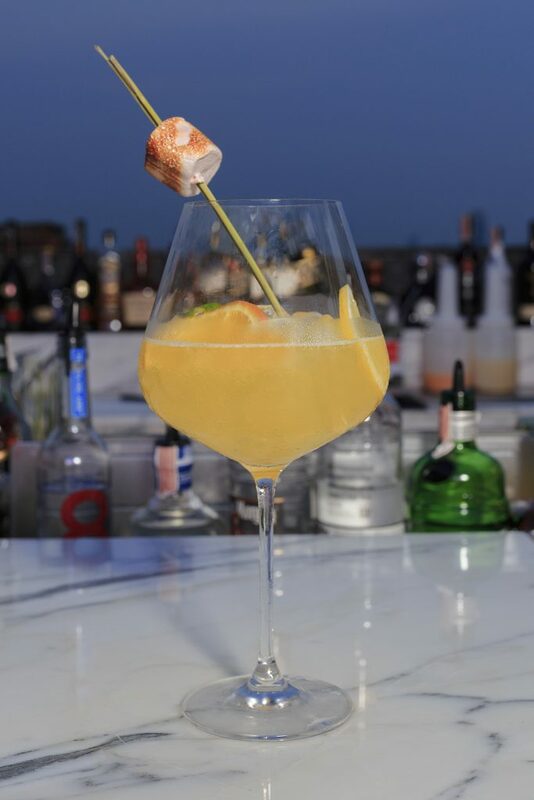 can’t do much better than the Hole In One (B330), which combines Tanqueray gin and Cointreau with lemon juice, lemongrass- infused honey syrup, orange juice and kaffir lime leaf. This citrusy cocktail offers a soothing relief after a hot day.